Scientists find seven new "microsnail" species, including the absurdly tiny Angustopila dominikae. If you think your job is tedious, you haven’t met the snail searchers. A staff of dedicated scientists have managed to sort through soil samples so carefully that they found a snail who could fit in the eye of a needle 10 times. As the Christian Science Monitor reports, Barna Pall-Gergely, a graduate student of biology at Shinshu University in southern China, and his team have identified some of the smallest land snails ever. The tiniest, the Angustophila dominikae, measured less than 1 millimeter tall. Some experts estimate there are over 10 million new species still to be discovered. 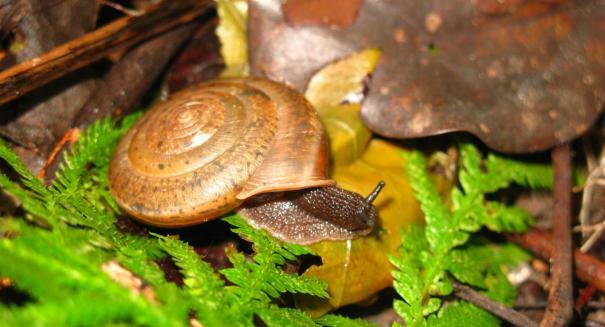 The newly found snail is believed to burrow in the ground near large limestones. Because only one has been found, very little is known about their eating or mating habits. The A. dominikae may seem insignificant but Pall-Gergely argues their discovery is still important. “We do not yet understand their importance in ecosystems; it might be more important than we would imagine from their size,” he says. Welcome to the family, A. dominikae.